When you express yourself as an actor, you use your body as the medium, the instrument, of expression. Your physical body (your voice, your face, your posture) are the channel through which your art flows through. Therefore, being attuned to your own body, feeling comfortable in your own skin (literally speaking) and in alignment with your breath, are essential. Yoga is an excellent complementary practice to your artistic expression, moulding your body into a strong anchor for your creativity. In addition, yoga activates the parasympathetic nervous system, helping you to relax and find ease even in moments of anxiety and stress. Conscious breathing is especially helpful for people who suffer from performance anxiety or stage fright. Whether you are a beginner or an experienced yogi/ni, the yoga sessions will provide you a colourful mix of fun, challenge, relaxation and self-discovery, and perhaps even some brand new perspectives – after all, there is a reason why yogis spend so much time upside down! 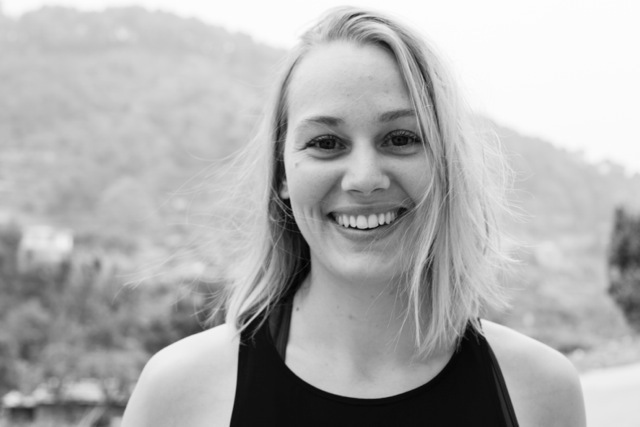 Kim’s feminine, warm and professional style of teaching yoga combines elements of hatha yoga, dynamic vinyasa flow and gentle restorative yoga, depending on the circumstances. As a teacher she creates a safe space, where you can connect to your body in a loving and playful way. Kim places much emphasis on correct alignment of postures, ensuring that your practise is also physically safe. In 2016, she completed the 200+ hour certified teacher training at the remote foothills of the Himalayas in Nepal, under the skilful guidance of Heather Elton, Annie Seymour, Emil E. Wendel and Andrew McGonigle. Yoga is an ancient (yet timeless) practice that was originally a psychological tradition of calming the mind and of developing self-awarenes. Yoga is essentially about body awareness and about bringing your focus into the here and now. When guided by the conscious breath, each pose becomes a point of integration where body, mind and soul meet. On a physical level, yoga opens up new spaces in your muscles and joints so that the breath can flow deeper and nourish the cells more fluently. Yoga creates strength, flexibility and balance not only of the limbs, but also of the mind. Learn more about Kim on her webside: here.